Hollins and 14 other private nonprofit colleges in Virginia will be developing comprehensive plans to implement solar power, thanks to more than $807,000 in federal funding from the U.S. Department of Energy SunShot Initiative. Sponsored by the Council of Independent Colleges in Virginia, the three-year program will help the colleges navigate the complex legal, regulatory, and technical challenges associated with installing solar systems, leverage group purchasing power to achieve price reductions for hardware and installation services, and create a learning network accessible by other organizations considering solar power. The goal is to create and implement a plan for participating institutions to deploy solar electricity within five years. This project has the potential to increase substantially the total amount of solar power now produced within Virginia. 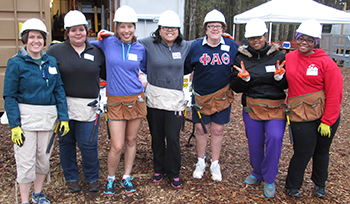 Hollins chaplain Jenny Frazier Call organized a spring break trip to Hilton Head, South Carolina. Students worked with other volunteers and future homeowners on building the first three houses of what will be a 16-house neighborhood. From left: Call, Victoria “Breann” Oaxaca ’15, Taylor Catron ’17, Kelly Demapan ’17, Maggie O’Leary AH, Noelle Ware ’17, and Proffitt Gurley ’17. 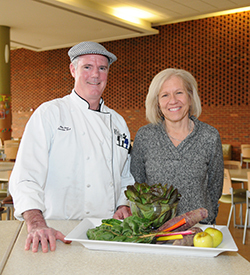 Executive chef Mike Shea and director of dining services Lee McMillan. That was the reaction nearly a year ago among some students when Meriwether Godsey (MG) became the food service provider for Hollins. A company committed to “fresh, local, and scratch,” says Executive Chef Mike Shea, MG made significant changes to the food served to the campus community—most notably a commitment to providing local produce. “It’s really nice when the girls come up to Mike and say, ‘The Brussels sprouts are awesome,’” says Director of Dining Services Lee McMillan. McMillan and Shea work closely with a small board of students to respond quickly to requests and concerns. “I go to the student board every week,” says McMillan. “They’re really into local food.” The board routinely visits student senate to give and receive feedback about dining services. Much of the locally grown vegetables and fruits comes from Produce Source Partners, which sources produce from a variety of local farms. Hollins’ own community garden also provides fresh produce. In return, MG provides compost for the garden.